Luckily my food memories are slow to fade. I’ve been wanting to capture David’s and my 2010 travels and all the great places at which we ate last year before hitting the road again this year. Food is not the only criterion we consider when choosing a vacation destination, but it is among the top 3. I admit we fall into the “will-travel-for-food” crowd and seek out tasty morsels wherever we happen to be. I’m usually the one who does the research. I start with the tourism bureaus; some places are big into food tourism and have great websites to promote local foods, producers, and tasty eats. I do city searches on Serious Eats, one of my favourite food websites, and Saveur, which does a great job at showcasing city trends and off-the-beaten-track places. I may check the local buzz on Urbanspoon. Finally, I discovered Tasting Table, which sends out interesting tidbits of daily food news in a national (American) edition, as well as city-specific newsletters for Chicago, Washington D.C., New York, San Francisco, and Los Angeles. Once at the destination, we will often plan where to eat first and then arrange our other activities around our chosen food stops. It may sound a little food-obsessed, but I happen to like to know that I’m going to eat something good and not be stuck having to find a “good place.” For me there are few things worse than bad food value and having to settle for a mediocre meal. Nevertheless, we still travel with a budget. We usually splurge on one more expensive dinner and find ways to keep our costs down by eating lunch (instead of dinner) at other restaurants we want to try, eating ethnic foods, and even cooking ourselves if possible. So where did we go and where did we eat?! Chicago, Vancouver, Oregon, and Salt Spring Island. 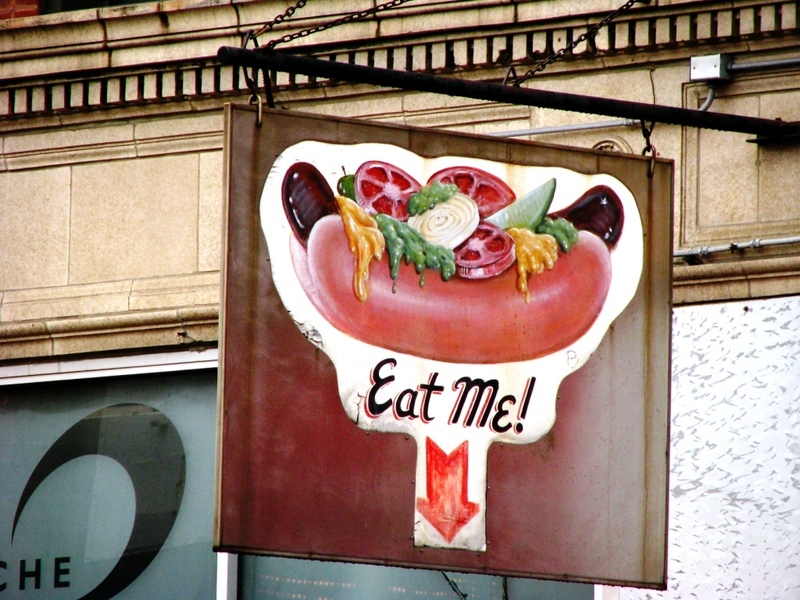 Sign inviting passers-by to eat a Chicago-style hot dog, i.e. topped with mustard, sweet relish, chopped onion, a pickle spear, tomato wedge, and a sprinkle of celery salt. It was 5 pm when we got to Chicago after two days of driving. We were hungry and getting cranky. We’d decided to stop at Calumet Fisheries (tip from Saveur Magazine) on the way into town. Thanks to the GPS, we managed to navigate our way to this little shack somewhere in South Chicago without any problems. Inside, a diverse 15-person line snaked its way around the tiny place. The dinner of smoked shrimp and fried fish hit the spot and was a perfect introduction to Chicago’s food scene. We punctuated our week-long stay with what I would consider reasonably healthy and interesting fast food places for lunch. Near Cloud Gate we ate Cuban sandwiches and salads with Caribbean flavours followed with rich, sweet coffee and alfajores at Cafecito. We found fresh and tasty sandwiches at Hannah’s Bretzel tucked into a downtown office building. Also downtown, we stopped at one of the several Wow Bao locations to have a fun meal of fusion-style steamed buns. One day we connected food stops on foot in a 12 km triangle, walking first to what seemed like the middle-of-nowhere to eat the obligatory Chicago hot dog at Hot Doug’s, then stopping for a beer at the then recently opened Revolution Brewery — which happened to be hosting delegates from the Craft Brew Conference and World Beer Cup while we were there — and ending the afternoon with a taco snack at Tierra Caliente, a Latino supermarket with a lunch counter hidden at the back. Not the kind of place we’d usually wander into, but a rewarding stop for our tastebuds! 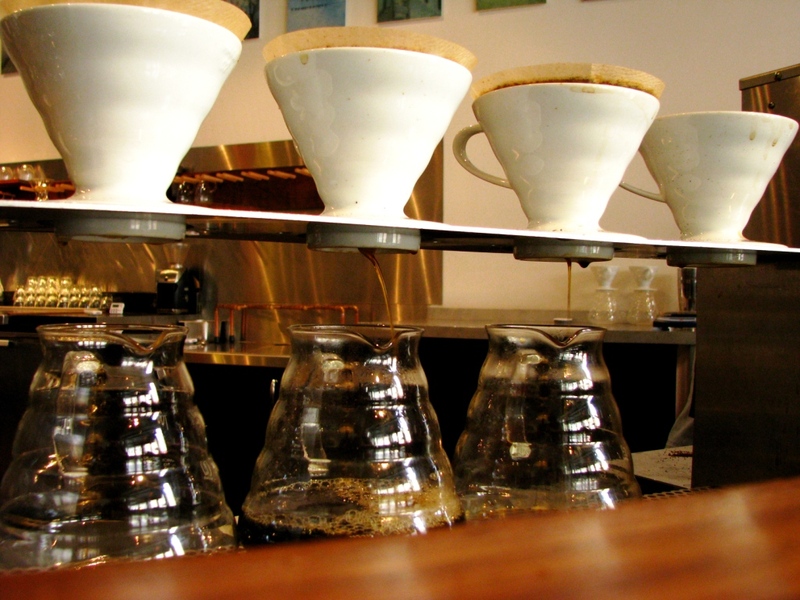 We did coffee breaks at Intelligentsia Coffee and Tea, where coffee and tea are treated like a fine wine and their preparations release aromas in ways you don’t experience in other coffee shops. It would have been amazing if our budget had allowed a meal at Alinea, but that was not the case (and I don’t know if I could justify to myself spending that much on a meal). Our dinner splurge was at The Publican, a place in the Warehouse District I discovered via Tasting Table. When I read about The Publican, I knew right away that it would appeal to David and, despite the offal-centric menu, I was tempted by many of the dishes and the originality of the space. We ordered more than we should have, but were delighted with our selection. The charcuterie plate was the highlight, showcasing a selection of homemade cured and prepared meats including lambcetta and the.most.sublime. homemade coriander and vanilla mustard. It was like eating savoury jam. We loved Chicago, not only for the food, but also its architecture, attractions, and an unpretentious big-city sophistication blended with a relaxed ambiance. We’ll go back, there’s no doubt! Super fresh sushi lunch for four from Village Sushi. Always a pleasure to be back in my hometown, and there are a couple of places that are musts on every trip. Village Sushi in Steveston is one of them. 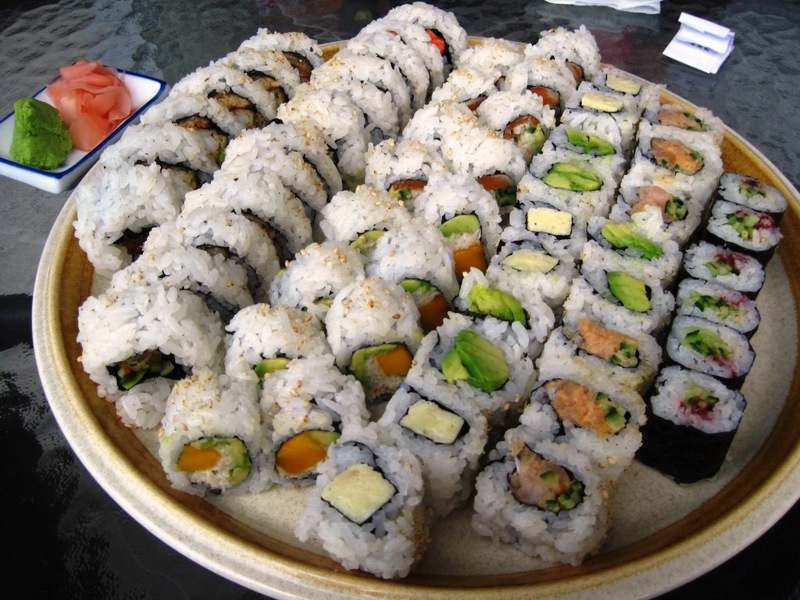 A small establishment run by a husband and wife team, they serve lovingly prepared, exceptionally fresh, and high quality sushi. What’s more, David and I eat our fill for $20-$25 including tip. 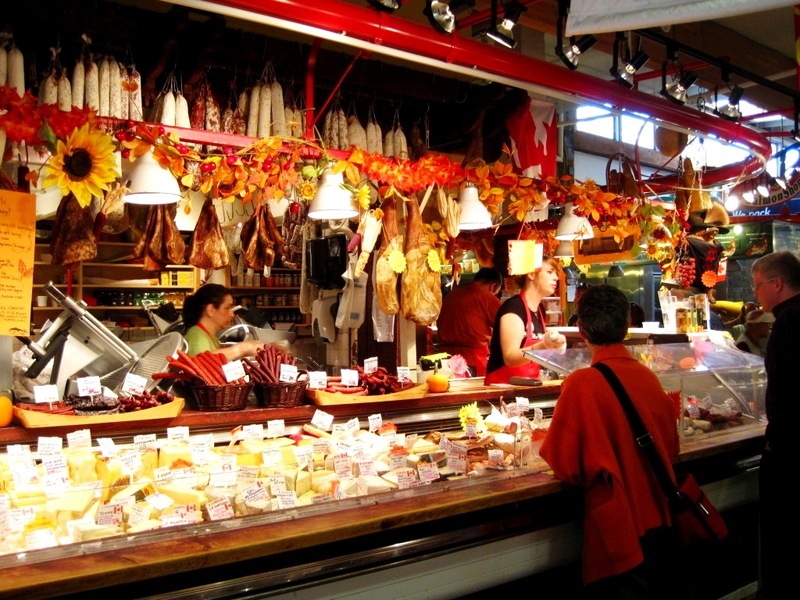 Another regular stop is Oyama Sausage Company at Granville Island where we inevitably buy guanciale – I have yet to find it in Ottawa – and one of their saucisson sec; Oyama has much more to offer though. Vij’s Rangoli is another place we visit regularly to enjoy a feast of inspired Indian cuisine. Oyama Sausage Co. at Granville Island offers a huge selection of carefully crafted sausages and other meat products made with high-quality ingredients. On this trip we discovered Chen’s Shanghai Kitchen tucked into a strip mall in central Richmond (home of the Olympic oval). A bright and clean establishment with a partly open kitchen at the back of the dining room. On one side there was a window through which we could observe a woman diligently and deftly making by hand one dumpling after another. The menu was different than the typical Chinese restaurant and it was hard to choose. In the end we had a combination of dishes that were new to us and familiar ones that we felt would be interesting to try in this restaurant. All of it was good, but I particularly appreciated the Buddha’s Delight made with Chinese cabbage, lily buds, at least two types each of tofu and mushrooms, and something I couldn’t identify, maybe wheat gluten. Next time I’d like to go back with a larger group to be able to try more! 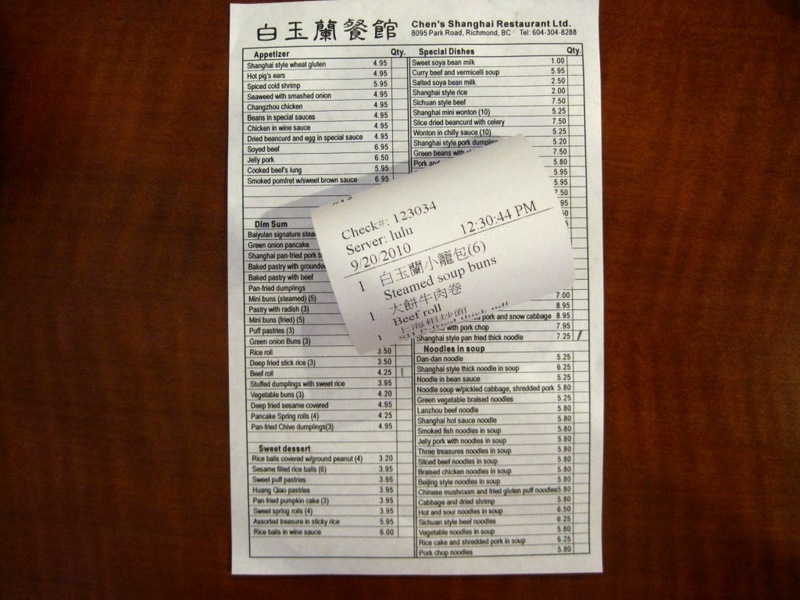 The menu at Chens Shanghai Kitchen. One of the best things about going to Vancouver though, is being treated to good things from my parents’ kitchen and garden. Notable from the last visit are home-smoked salmon and fresh quince from the tree. 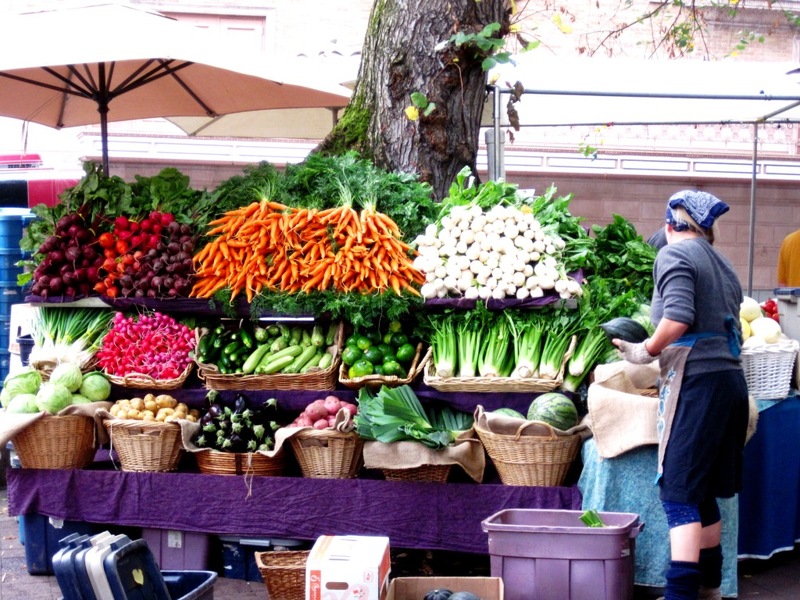 Oregon is one of those places that actively promotes food tourism and has an elaborate website dedicated to the subject. Very useful for trip planning. After spending a couple of days in Portland, with its thriving food and micro-brew scene, we drove through the lush Willamette Valley to get to Newport on the Oregon Coast, an active fishing town with a working waterfront, and ended with a too-short one-night stop in Astoria, which was for me the surprise gem of the trip. Most of our “serious” eating happened in Portland. At Clyde Common, we witnessed the delivery of a whole lamb from a nearby farm as we sat at a communal table eating delicious lunch sandwiches. From our seats at the end of the bar at Olympic Provisions, we had a view of the kitchen and saw them breaking down meats and preparing their housemade sausages. Famous for its food carts, we were lucky to score a comforting meal of chicken and rice at Nong’s Khao Man Gai before the chef ran out. We also had some hearty and tasty breakfasts at Buddha Bites. Meanwhile the burger at Violetta, a food-cart-turned-restaurant, hit the spot after a long day of walking around town. 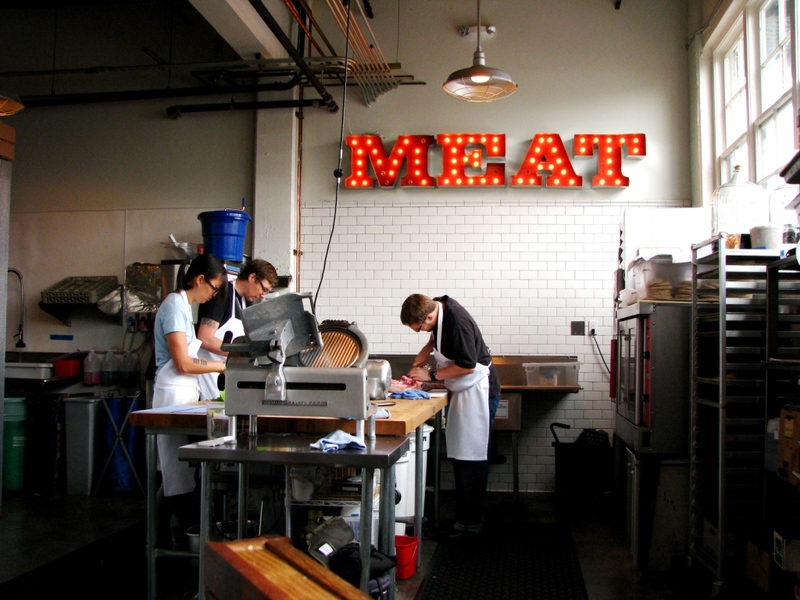 Making charcuterie at Olympic Provisions, Portland. We were lucky to get the seats with a view from the lunch counter. 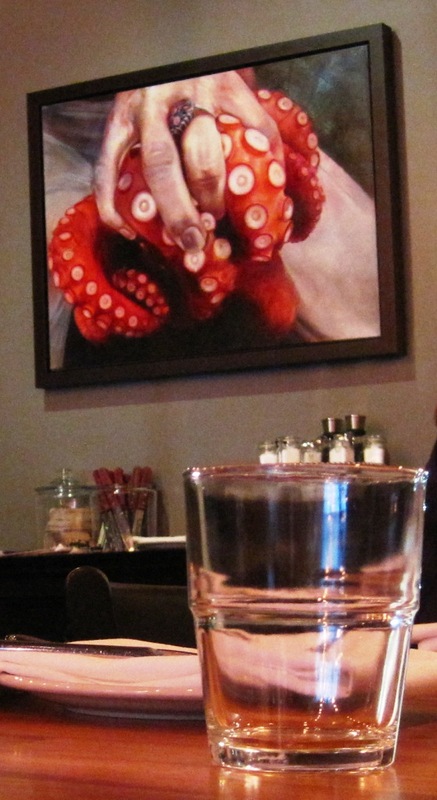 Our dinner splurge, which happened to be our anniversary dinner, was at Beaker & Flask. We came across the restaurant in a magazine article in which the chef at Beast, one of Portland’s top restaurants, mentioned that Beaker & Flask was one of her favourites. We figured if she liked it, then we would too! Although known for its cocktails, the food was outstanding, and the service genuinely friendly and professional. For me, the most delicious discovery during this meal was the Padrón pepper. Lightly fried and salted, it was part of an vegetarian antipasti plate I’d ordered. Addictive. I’m hoping I can find some seeds and grow some myself! Meanwhile David had an enlightened conversation with one of the waiters about forcemeat, his latest food interest. 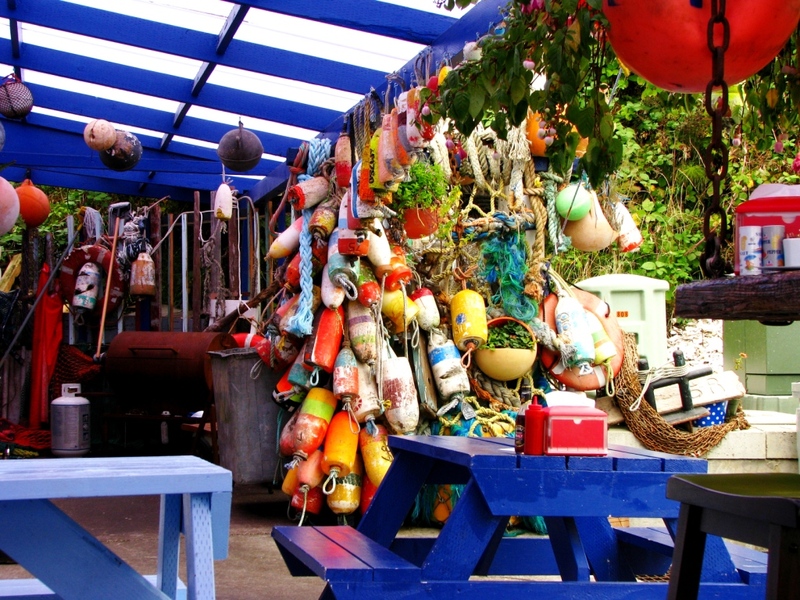 Colourful fish & chip lunch place in Newport. On our way to the Pacific Coast, we did some wine tasting and picked up a couple of bottles on our drive through the Willamette Valley. We were enthusiastically welcomed at the Willamette Valley Cheese Company, where we tasted a surprisingly flavourful mozzarella cheese – the traditional method of hand-pulling the cheese makes all the difference. Our lunch stop was in the charming town of McMinnville, well worth a visit. 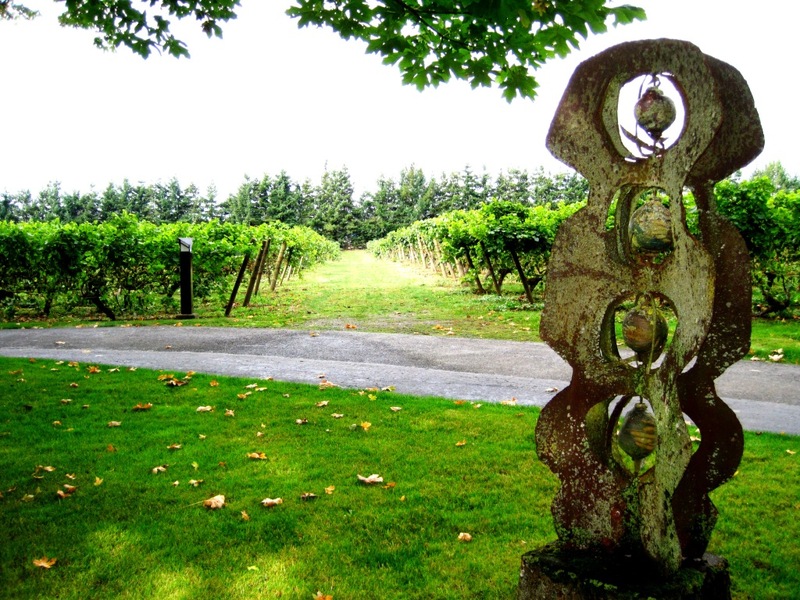 Vineyards at Ponzi Estate, Willamette Valley. With the sound of the waves accompanying our meal, we ate fish and chips in Newport, but missed out on Dungeness crab, the official state crustacean. And well, our stay in Astoria located on the banks of the Columbia River just across from Washington State (where The Goonies and Kindergarden Cop were shot) was just too short. Nevertheless, we managed to stop in at Josephson’s for some smoked fish (next day’s lunch) and had dinner at the Fort George Brewery + Public House, which happened to be serving its seasonal Hopstoria Fresh Hop Ale made with hops collected from local gardens and backyards. How cool is that?! Astoria definitely deserves a second visit. 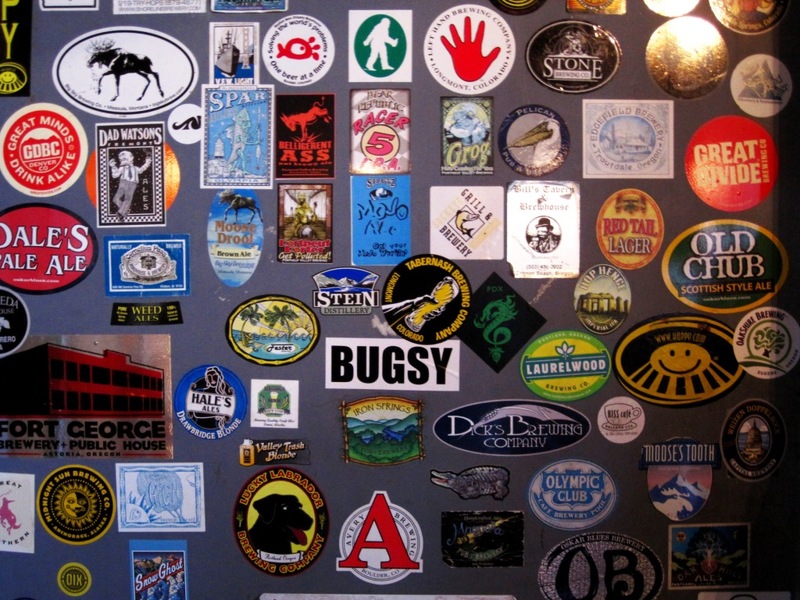 Oregon brewers sticker collection at Fort George Brewery + Public House. Our accommodations in Oregon are worth mentioning: the contemporary Hotel Modera in Portland (got lucky; we booked a Travelocity secret hotel), the charming if a little musty Sylvia Beach Hotel in Newport with stunning views of the coast (when it wasn’t foggy or raining), and the historic Commodore Hotel in Astoria. We only spent a week driving around Oregon, but that short visit convinced me that I need to go back for a longer (at least three-week) road trip! We drove from Oregon to Port Angeles where we took a ferry to Victoria, then another ferry to Salt Spring Island. I think Salt Spring Island is a great place for a holiday. For me, it has the right combination of nature (countryside, forest, ocean, elevation, coastal wildlife), art, and food. My favourite food stops are the Salt Spring Island Cheese Company, maker of goat’s and sheep’s milk cheese, Salt Spring Island Bread Co., maker of organic artisan breads baked in a wood-fired oven, and Bruce’s Kitchen. The Farmer’s Market in Ganges is also lovely to buy fresh island produce and chat with the locals. The Salt Spring Island Cheese Company is located in a beautiful wooded area. A short self-guided tour takes visitors around the outside of the building where the cheese is made offering windows on each step of the cheese-making process. But the best part is tasting the cheese in the shop! My favourites are the soft fresh chèvres and the surface ripened Juliette. The drive up to the Salt Spring Island Bread Co. is worth it as much for the bread as for the view of the ocean from the hilltop location. It’s also worth buying several loaves of the delicious bread, since the bakery is not open every day. Bruces Kitchen on Salt Spring Island. Even without the words, the sign visually says it all! 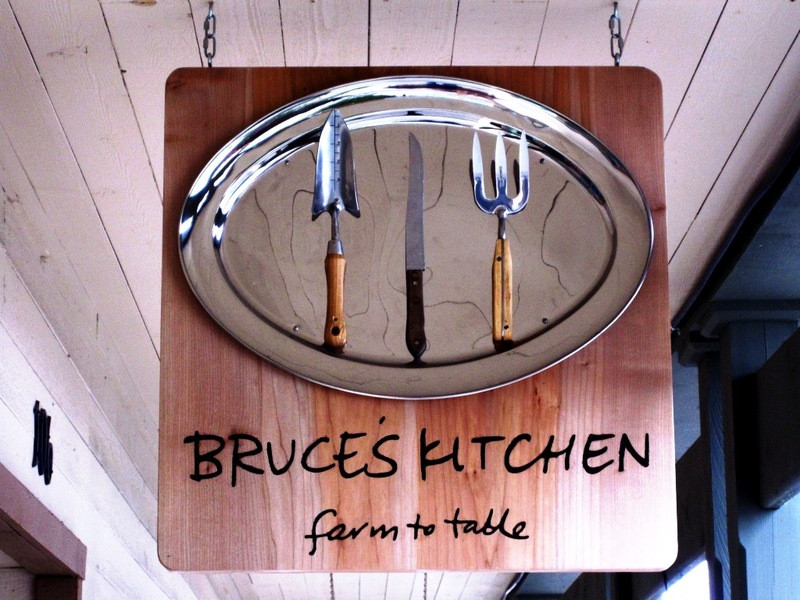 Bruce of Bruce’s Kitchen used to live and work (at Mariposa Farm and the Urban Element among others) in Ottawa. He moved West several years ago and opened Bruce’s Kitchen where he serves up daily specials made with the best local ingredients. His passion for food definitely flavours the fresh and wholesome dishes he cooks up in his tiny kitchen. Wow, all these memories of great food eaten in great places are making my mouth water and my feet itch! Luckily we’ll be packing our bags soon. I feel an inexplicable connection to Edgar, a new neighbourhood café near Parc Moussette in Hull. Maybe it’s because I have my own dream of opening a little hospitality-related place, something like a bed & breakfast. Since I discovered in late September that Marysol of she eats bears was opening a café, I watched with admiration and anticipation as she made one of her dreams come true. It takes courage to do that. And smarts. And perseverance. I wish her success. Based on the buzz around the café’s opening, the growing chorus of glowing reviews, the packed tables, and sold-out menu items, I have no doubt she will be successful! Maybe it’s also because I’d like to create a connection to Marysol herself. I barely know her, but she seems like the kind of person I’d like to get to know better – Someone down-to-earth who shares a passion for good food. Luckily now I can go to Edgar, and if it’s not super busy, chat a little. She already gave me a baking tip the other day! In any case, the strongest connection is the tangible one. It’s going into a chic little café, feeling the positive energy, and being greeted with a warm smile. Of course, there’s the delicious food – homemade with love. Some tools of the trade. Where good food is made. 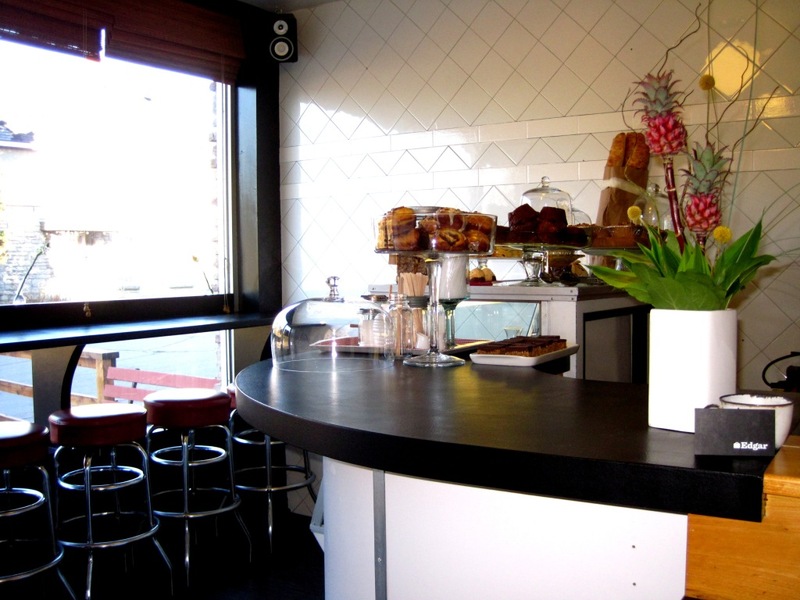 Small stylish interior with a selection of homebaked sweets including the infamous brioche in the background. My order disappeared too quickly to be photographed! I’ve tried several of Marysol’s creations, all fresh, flavourful and prepared with flair: cheddar and apple panini with caramelized onions (sweet and savoury harmony), Vietnamese sandwich (crisp and delicately spicy), breakfast wrap with egg, goat cheese, bacon, mushrooms and greens (fresh yet hearty), date and bacon brioche with orange glaze (sweet originality made better with bacon), Edgar bar (curiously nutty and delicious), and the apple-pecan muffin (wholesome caramel-y goodness). The coffee is good too! Edgar serves my ideal cappuccino: a “small” cup with perfect proportions of coffee, milk, and foam. 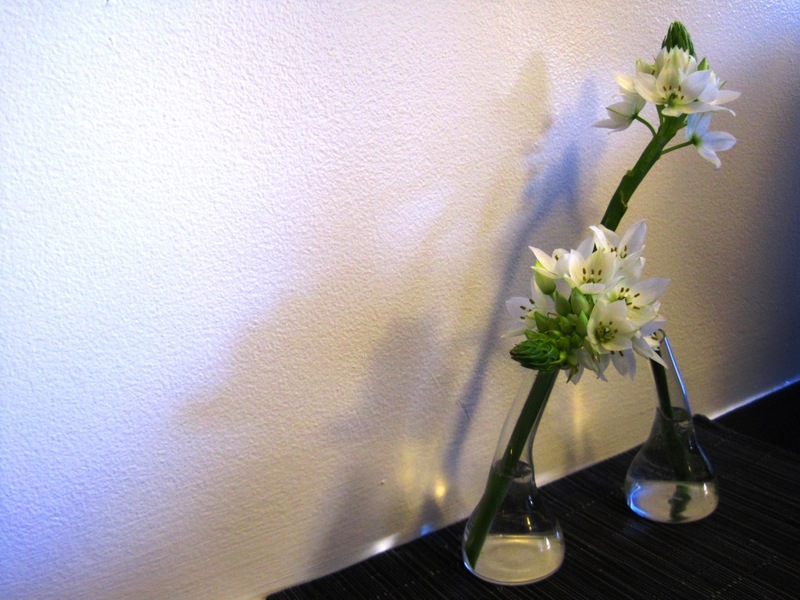 Fresh flowers, just one of the pleasant little details at Edgar. Soups, sandwiches and sweets are made from scratch, with love and local ingredients (sometimes from her own backyard). Creative flavour combinations. There’s some serious tastiness coming out of the tiny kitchen. Menu changes every day based on what’s fresh, the season and the inspiration du jour. 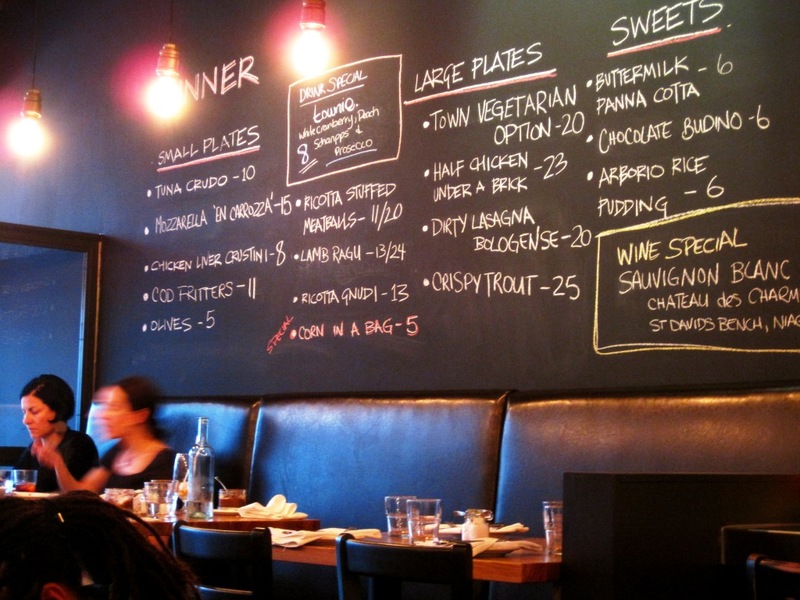 I love handwritten menu on chalkboards! Everything is served with a smile. The cash receipt reads “miam miam miam.” Oh, how true! Fresh frozen soups and meals to go. Simple, stylish and cozy interior. Marysol’s blog makes my mouth water – tasty recipes and beautiful pictures – and you can see how Edgar took shape. 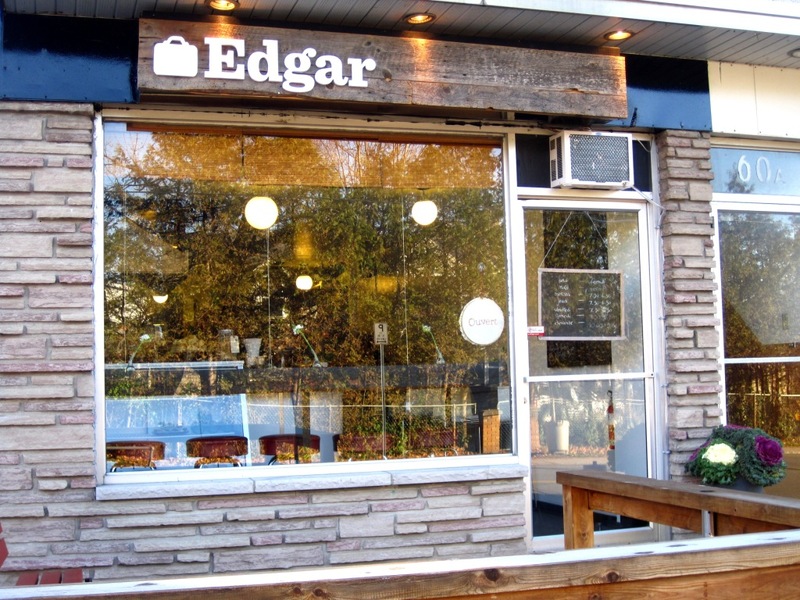 Edgar is just off the Voyageurs bike path in Gatineau, a short ride from Wellington West and Westboro! Go early (especially if you’re looking to try the infamous brioche)! On busy days, Edgar will sell out. Be prepared to take your order to go. It’s not unusual to find all 11 seats taken. We were so busy talking and eating, that this is the only picture of the evening! The pressure is on when it’s up to me to suggest a restaurant for a girls’ night out. If the eatery is one I’ve been to before, will it be as good as last time? 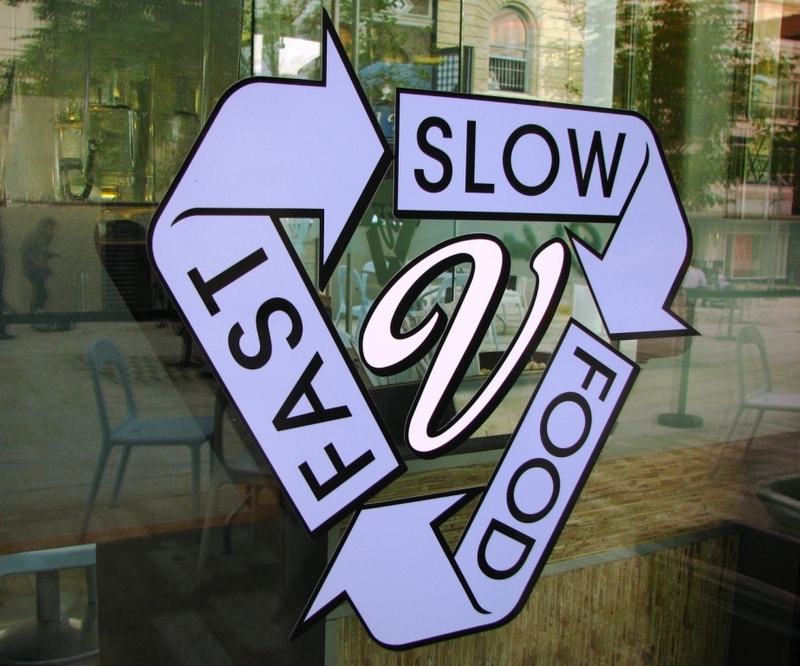 If the establishment is new to me, will the food be fresh, interesting and tasty? Will the service be friendly and professional? And most importantly, regardless of whether the restaurant is new or known to me, will the girls like it? Oz Kafe fell into the “new” category for me. Word-of-mouth brought me there, which leads me to the fact that there’s not that much information about Oz Kafe online (compared to other restaurants). Happily, it was a terrific recommendation and I think Oz Kafe is one of the Ottawa food scene’s best kept secrets. The girls all had a seasonal squash soup to start. The smooth sweetness of the squash was contrasted nicely with a fried leek garnish. I chose the classic yet contemporary roasted hearts of romaine Caesar salad cleverly pimped up with homemade bacon lardons, fried capers, shaved Parmesan, roasted garlic and maple dressing, and fresh lemon. The daily main course specials tempted several girls: a generous local pork chop served with homemade dumplings and many other good things (so many, that I can’t remember them all), and perfectly cooked seared sea scallops with Jerusalem artichokes and pickled beets. One girlfriend, a steak fan, had the cast iron-grilled steak accompanied by mashed potatoes and the roasted romaine hearts Caesar. Meanwhile, my neighbour and I chose a second appetizer as a main course. She had a beautifully presented tuna dish with fresh goat cheese. I had the “Seoul Food,” Korean-style barbecued beef that came with a plate of accompaniments (kimchi, julienned carrots and daikon, and spicy soybean sauce), so that I could make my own lettuce wraps. The beef was tender and the wraps made for a light main course. Only the two of us who had appetizers as a main course found room for dessert. She had the chocolate torte, which is intended to have a fondant center although hers was more cake-like than melting, but was delectable nonetheless. I had a bread pudding with the.most.delicious apple pie gelato. Refreshingly satisfying. Our server was pleasantly patient and adapted to our pace, as we spent more time catching up than preparing to order. The girls and I agreed that Oz Kafe served up delicious food with a smile. 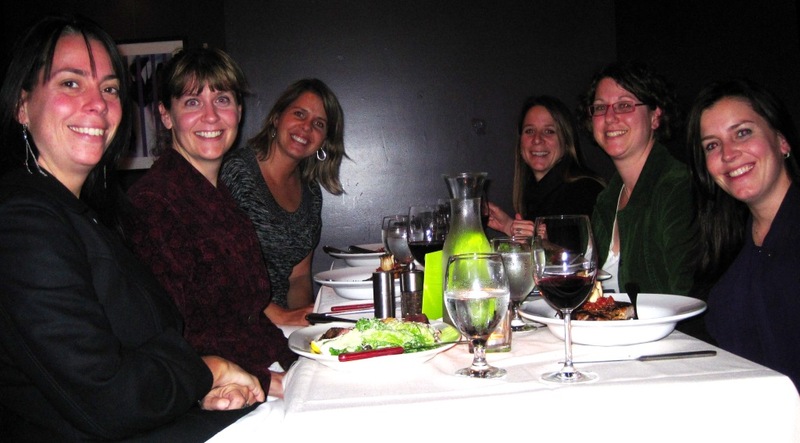 Paired with great conversation, we had a wonderful night out! Good selection of eclectic starters and mains, including fresh daily specials. Many dishes are perfect for sharing, so you could spend the whole evening nibbling, gossiping and tasting a variety of dishes. Generous portions. I had two starters and it made for the perfect size of meal, with room for dessert! Enthusiastic, efficient and friendly service. Good value: tasty food at reasonable prices. The Oz Kafe website is a “one-pager.” Better to access the reviews on ottawafoodies.com and pictures of the menu on urbanspoon.com. The interior is cozy, but could use a bit of sprucing up. I think what it says on the menu "..and wants you to be happy." is true! Corn in a bag with smoked tomato butter, lemon confit, pecorino, roast garlic and chives. I've never had corn like this before! This painting is certainly the focal point of the room: a bold shot of colour and so intriguing. Check out Town’s url and you’ll find townlovesyou.ca. 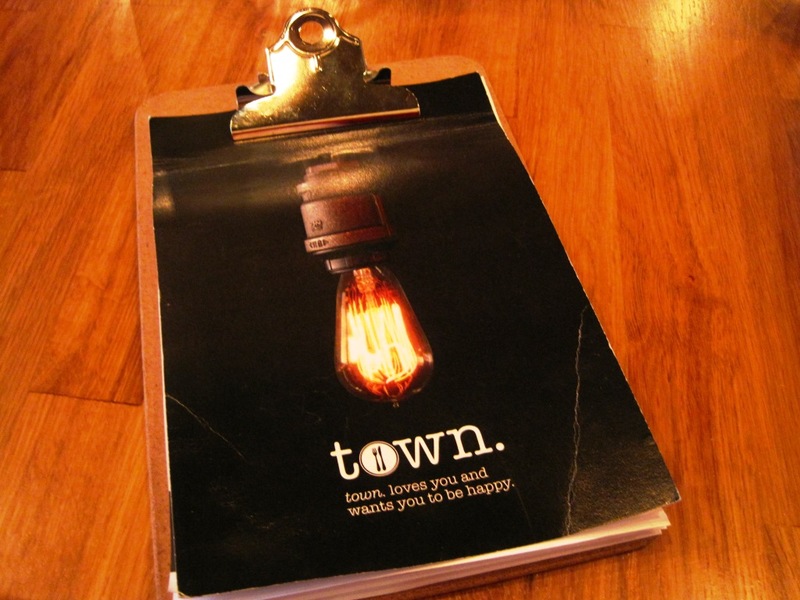 After eating there last weekend, I’m ready to love Town too. We were off to a good start when I got a smiley voice on the phone. The welcome at the restaurant was warm. 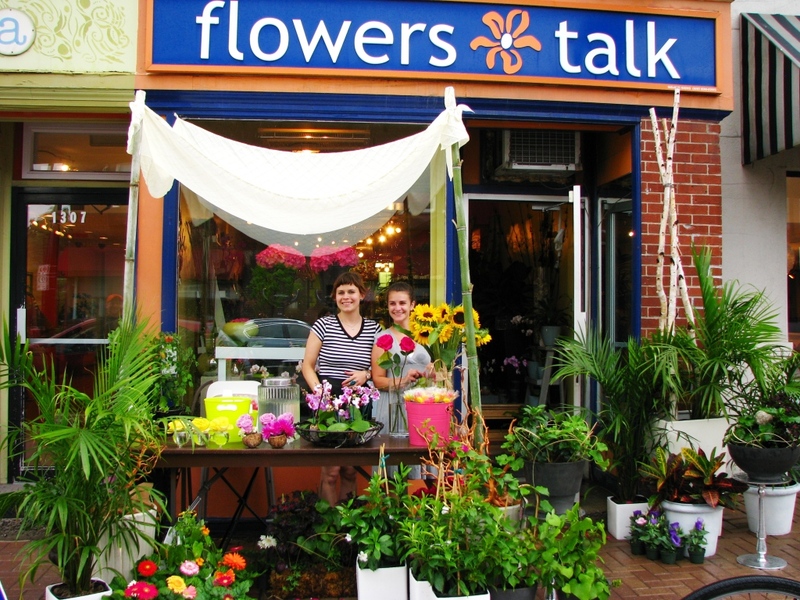 The service genuinely friendly and knowledgeable throughout the evening—thanks Jenn! The décor is appealing too: fresh, contemporary and comfortable. Next came the food. It was, one dish in particular, finger lickin’ good. Literally. I’ve never been to a restaurant that serves corn on the cob. Actually, corn in a bag. 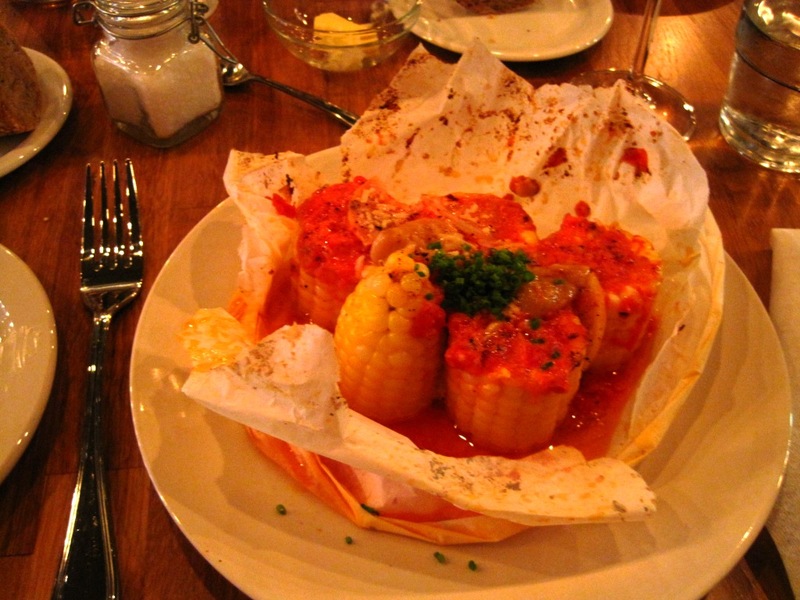 Sweet seasonal corn on the cob, cut into pieces and cooked en papillote with smoked tomato butter, roast garlic, lemon confit and grated Pecorino. To serve, they slit open the papillote, and sprinkled with chopped chives. I got to eat with my hands! Attempting to daintily cut the kernels off the cob with a fork and knife just didn’t seem right. The corn in a bag was A.M.A.Z.I.N.G. Sweet, smoky, salty, buttery. The Thirty Bench Riesling I had with the corn was a perfect complement. The other dishes were no less tasty. David started with chicken liver crostini with rhubarb compote and bacon, a delicious contrast of textures and flavours. Then he had the dirty lasagna made with braised beef and topped with Swiss chard and a poached egg. Tender and flavourful. The portion was enough to make a lunch the next day. I followed the corn in a bag with ricotta gnudi dressed with coarse pesto. They were pillowy light. So simple, so good. The buttermilk panna cotta was tempting, but unfortunately I had no room left. Neither did David. The food is prepared simply. It’s creative, yet familiar and comforting. Service is super friendly. Town is a happy place. It’s unpretentious, a relaxing place to be. An original collection of vases and glass containers lined one wall, each one filled with a flower. Town’s website is a “one-pager.” The Facebook page has more info, including menu. There’s a bright light in the kitchen. It’s somewhat disturbing when sitting toward the back of the restaurant, particularly when the lights are dimmed. The restaurant isn’t that big, so probably best to make a reservation. 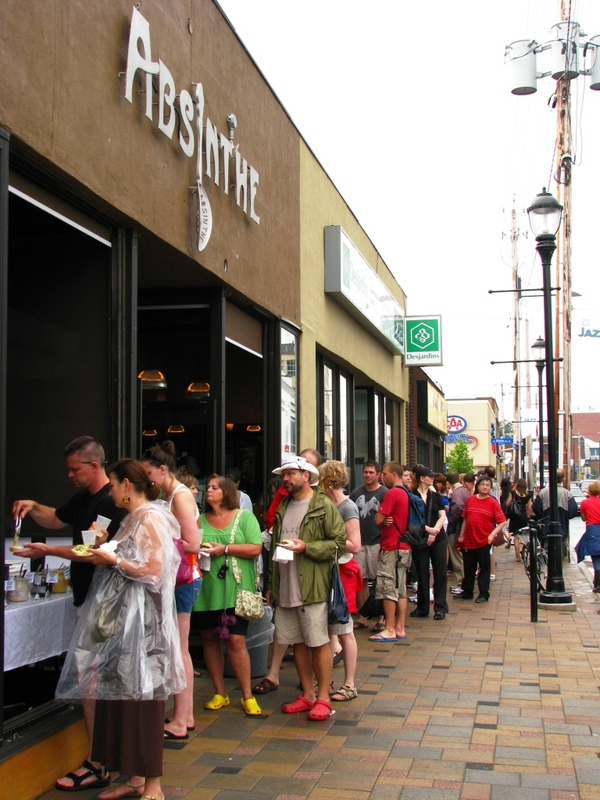 Crazy line-up at Absinthe. It looked like they were serving a gourmet mini burger. No doubt delish, but I decided to pass. Free food is guaranteed to attract a crowd. 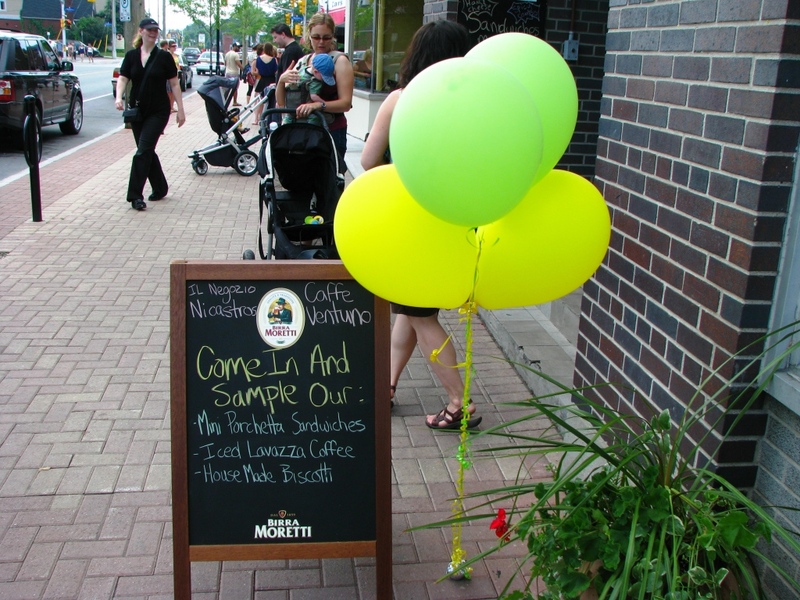 It’s no surprise then that the sidewalks were crowded along Wellington Street West for the 4th annual Taste of Wellington—smart marketing on behalf of the Wellington West BIA for the area also known as “Epicure Row.” It did a fabulous job of enlisting 36 eateries between Somerset and Island Park Drive to participate and promoting the event throughout town. 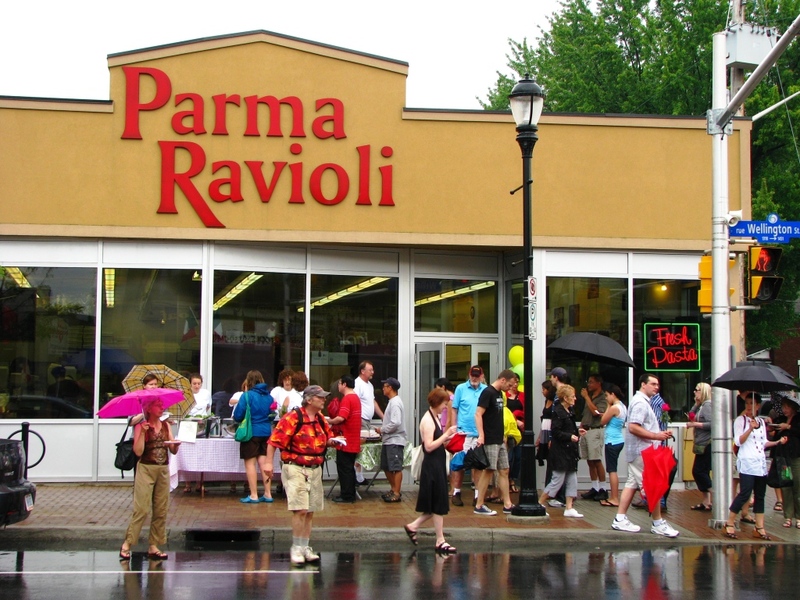 Other businesses joined in with sidewalk sale items, giveaways or entertainment. Hintonburg’s Causeway Work Centre was collecting donations from visitors. The 36 eateries participating in Taste of Wellington are marked with balloons. I have the pleasure of living in the neighbourhood and being familiar with several, but certainly not all the hood restaurants and food shops in the area. Shortly before 1 pm, I braved the downpour and made it as far as the Bagelshop, where I wasn’t the only one seeking refuge from the rain. Despite the promise of free food samples, I had a bagelsub. I was hungry and didn’t want to depend on the samples for lunch.In hindsight, I could have. The food bites were plentiful. Once the sun came out, the crowd got bigger and the line-ups longer. 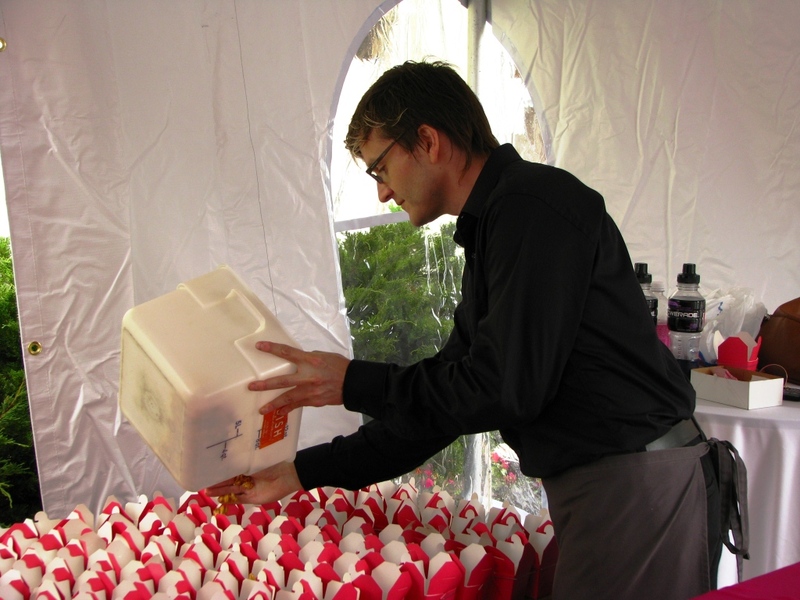 At 3 pm, the sampling was still in full swing at many places. Serving organic smoked chicken burgers at Allium Restaurant. Behind the sign is the one of two boxes of herbs and produce growing in front of the restaurant. Fresh and local. Allium is one of the restaurants I haven’t yet dined at. I had their duck schnitzel with crunchy cabbage on a soft pretzel at Beau’s Oktoberfest last fall and it was fabulous. Today, they were serving delicious organic smoked Mariposa chicken burgers with avocado mousse and mango salsa. Allium is definitely next on my restaurant-to-try list! Note the raised boxes in front of the restaurant are planted with herbs and tomatoes (supplied by Mariposa Farms). The people living across the street can probably witness the chef picking fresh greens and produce for the evening’s dishes. Filling the serving boxes with caramel-gingerbread-curry popcorn. The mini lamb burger was nestled on top. It’s too bad the new Dish Catering space on the corner of Fairmont and Wellington will be reserved for events and catering pick-up, i.e. not open to the public, because the exotically-spiced, perfectly grilled (not dry) lamb burger was full of flavour! It was accompanied by caramel popcorn that tasted of gingerbread enhanced with curry. I would eat there if it was a restaurant. 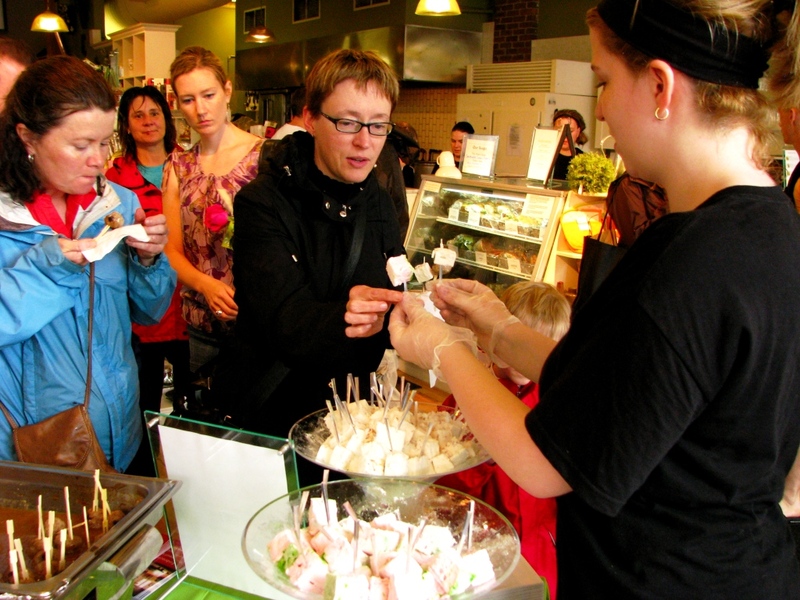 Thyme & Again serving watermelon marshmallows at Taste of Wellington. Fun, light and delicately flavoured watermelon marshmallows served by smiling faces at Thyme & Again. As it got warmer, I was grateful for the refreshing drinks I tried at Nectar Fine Teas (cool citrus oolong tea) and Siam Bistro (Thai iced tea made of a black tea from Northern Thailand mixed with condensed milk). I didn’t drop in on my neighbourhood favourites The Wellington Gastropub, Three Tarts and Sushi Umi, but I’m sure their samples delighted those who had them. Flowers Talk had the most colourful stand at Taste of Wellington. Thanks for the beautiful rose ladies! 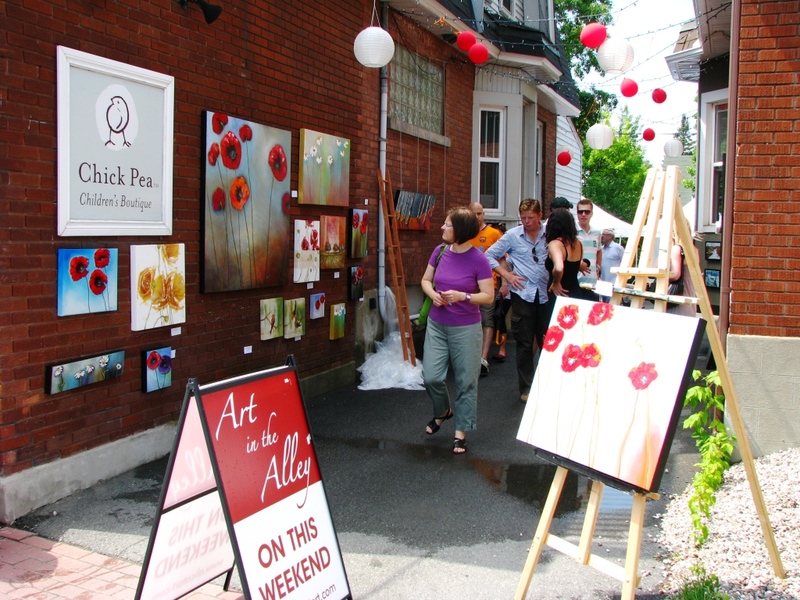 Art in the Alley organized by Alicat Art Studio dresses up with fab canvases, lights and lanterns and livens up with musicians the alley next to Alison Fowler's studio. In addition to the food samples, I was thrilled to get a long-stemmed rose from the ladies at Flowers Talk (I love the quote “earth laughs in flowers” on the business card—I just made myself a pottery plaque with same quote by Emerson for my garden). 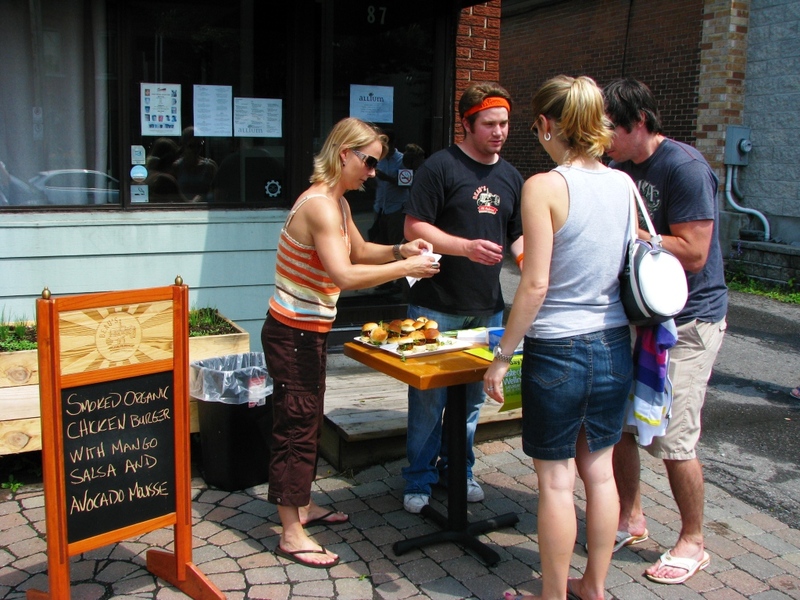 I was also happy to see Windhorse Yoga doing demonstrations on the sidewalk, and Art in the Alley hosted by the artist Alison Fowler of Alicat Art Studio. I spotted other local artist Andrew King stopping by the alley too. I took refuge from the rain a second time at the Cube Gallery. I love that the gallery is so unpretentious. Makes it easy to stop in and just admire the artwork. A great and tasty afternoon in the village. I’m already looking forward to next year! Shucking oysters for one of many oyster platters served at Whalesbone. 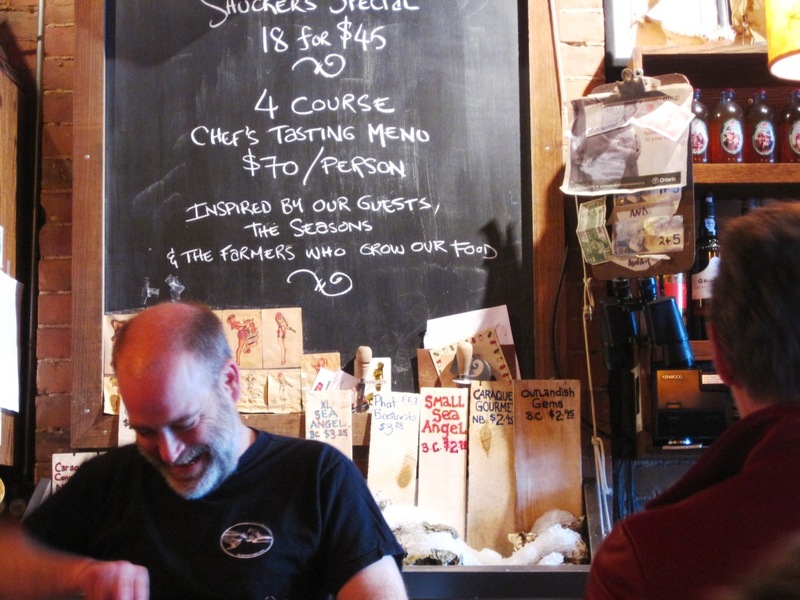 The Whalesbone Oyster House gets positive press and comes highly recommended by friends. I finally made it there last week and it was love at first bite, literally. Soon after being seated, we were served bread and butter. The butter was different. It had a nutty, toasted flavour. Beautiful. Turns out they heat butter until the milk solids caramelize (make brown butter/ beurre noisette), then mix it back into softened butter. Wow, what a great start! Although there were several tempting dishes on the menu, we chose the four-course tasting menu. When asked if we had any allergies, I suddenly realized I had a dilemma… I don’t like seafood. Fish, yes. Seafood, not so much (and I’ve tried). But either the whole table takes it or no-one gets it. So, I went for it (no mussels or clams) and thankfully so! Not only did I try new things, but the meal was simply sublime. 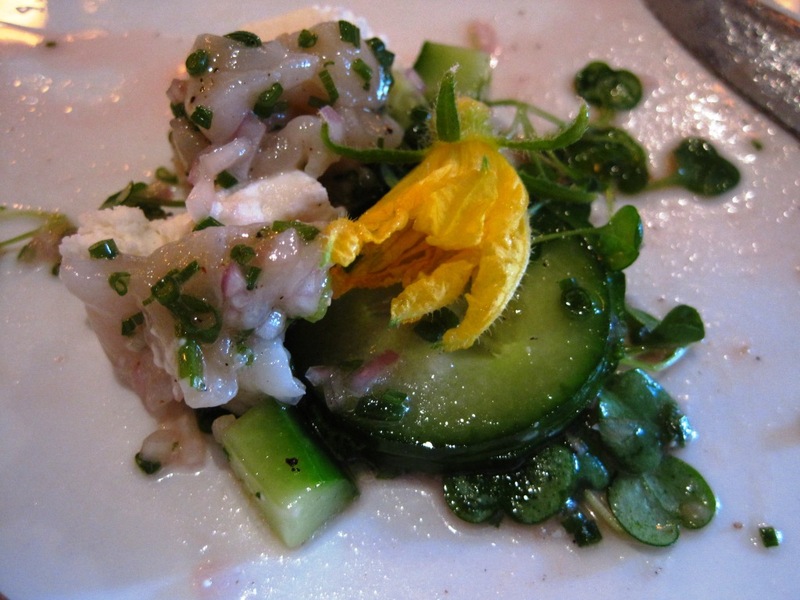 Scallop tartare with cucumber. A delectable mouthful, captured just before the last bite disappeared. First, tender and sweetly of sea-tasting scallops contrasting with the sweet crunch of cucumbers and the salty crunch of fleur de sel, balanced by the acidity of a blood orange vinaigrette, rounded out by soft, creamy goat cheese. Second, bright green spring peas and asparagus with grilled morels and fresh herbs hosting the red-speckled flesh of a lobster claw. At this point, all the tables around us were getting fresh oysters. David couldn’t resist. We ordered a four-oyster palate cleanser. The XL Angel from B.C. was the size of the palm of my hand. We discovered the difference in taste between farm bed-raised oysters and ones finished on the beach, i.e. left to roll in the surf. The latter have more flavour. We also learned how baby oysters are made. Then, salmon on a bed of pre-summer succotash (corn, tomatoes, small gnocchi, ramps). And, to end it all, sundaes with Pascale’s vanilla ice cream and deliciously fun and fresh toppings. As I left the restaurant, I almost felt guilty. Did I cheat on the Wellington Gastropub, my other favourite restaurant? Blushing yes. My first date at Whalesbone was such an exceptional experience, that it now shares first place for favourite restaurant on my palate. The food is fresh and perfectly prepared. I want to say that you can tell there are women in the kitchen, but there’s no way I could prove that! It’s Ocean Wise certified. The fish, oysters and seafood come from sustainable sources. Staff is friendly, attentive, patient, and knowledgeable. The kitchen is tiny and open. You can see the chef at work. The counter that divides the kitchen from the restaurant is home to fresh sprouts. Snip and plate. The restaurant is cozy. The atmosphere is happy, warm and welcoming. There’s a sense of humour in the décor. Chances are high that you’ll have a friendly conversation with the people at the next table. It has a retail store, where you can buy fresh fish, oysters and seafood, smoked fish and a brown bag lunch. It’s snug. Not much space for private conversations. Seating is limited. Best to make a reservation. On May 12, La Presse published an article about Ottawa, which listed some of the great shops and restaurants in Ottawa. Whalesbone was on the list. As we were digging into dessert, two older gentlemen came into the restaurant with this article from La Presse. No tables available, so they took two seats at the bar. It turns out they had come from Montreal to eat at Whalesbone! No doubt, it was worth the drive. It’s May 23 and I just found a blog post by Lynne Frappier—from inside the kitchen on that same evening—about the same two gentlemen! The highlight of my Gastropub meal on Friday, April 30. 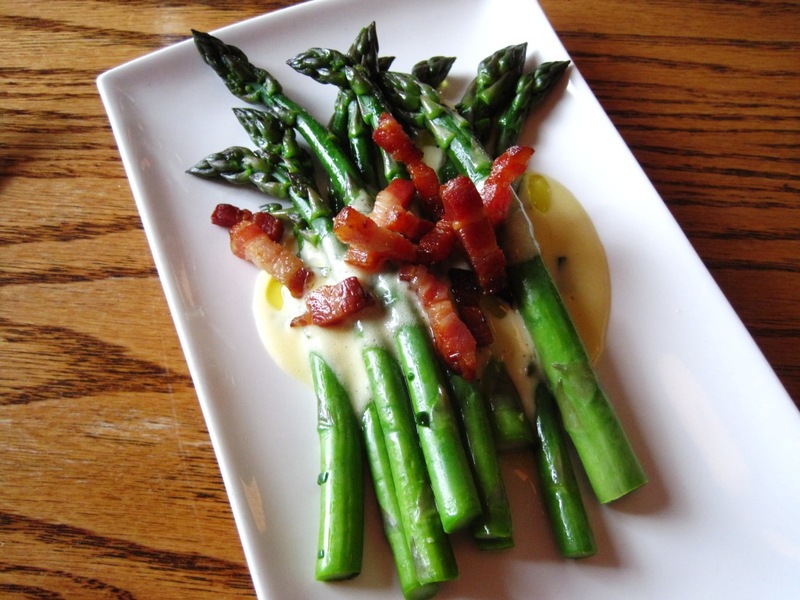 This appetizer captured perfectly, and simply, the spirit of spring: asparagus with bearnaise, lardons and truffle oil. For me, there are few better ways of spending an evening—and my money—than discovering and enjoying good food. Food is entertainment (and much more); our spending on other leisure activities is minimal. It’s no surprise then that sometimes I think we could have a budget line dedicated to the Wellington Gastropub. It’s our neighbourhood restaurant and we end up going there about every 2 months. Although there are many others, we always gravitate toward the Gastropub. It offers good value on the plate, and we know the food will be tasty and fresh. But the service is, in my opinion, what really sets it apart. On our very first visit 3 years ago, we were greeted warmly and made to feel that we were important to them. It’s still the same today. By now, they know our names and we know theirs. We have conversations with them about where the food comes from, exchange tasting notes, tips and other food adventures. It’s a personalized and highly enjoyable dining experience. As a result, we probably allow ourselves to indulge a little more at the Gastropub, but we are also recognized from time to time for our loyalty, which only strengthens the relationship. I realize that this is smart business for them, but I do believe it’s sincere, smart business. And, the food is consistently good. Few restaurants in town manage to get the whole equation right. Since they seem to have adjusted the size of their mains (portions used to be so generous, that it was often too much), I would make only one suggestion: add more vegetables to your plates! The food is contemporary, fresh and well-prepared. 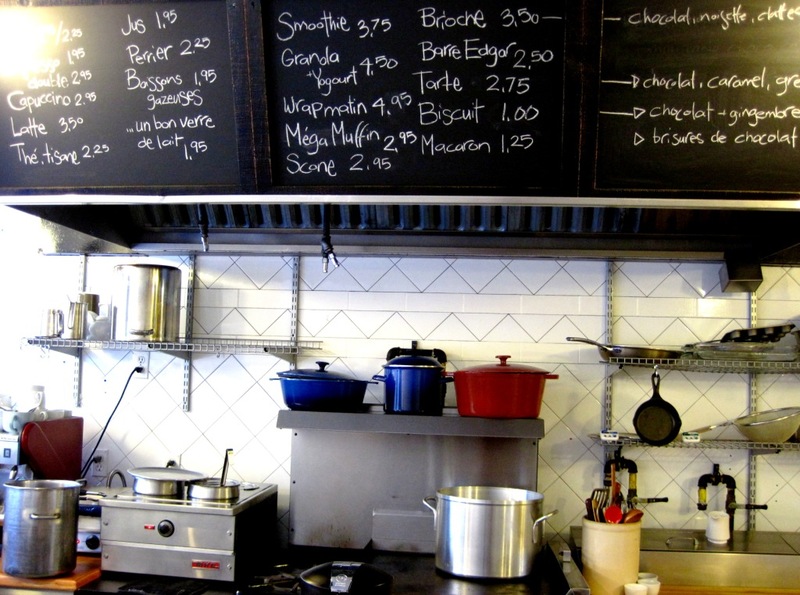 The menu is small, changes daily, and features local producers. The portions provide good value on the plate. There’s a changing selection of Ontario beers on tap and a good by-the-glass wine selection. The servers are congenial, knowledgeable, enthusiastic, and unpretentious. The atmosphere is convivial and casual. Book early for tables on Friday and Saturday nights, but reservations are probably best any night of the week. The menu gets put up shortly before the restaurant opens (and the website only has a sample), so you’re in the hands of the chef. It can get loud/noisy as the evening wears on. Some interesting music choices in the background. Family friends Erwin and Josette Doebeli are the ultimate restaurateurs and veterans of the Vancouver food scene. David and I had the pleasure of hosting them in Ottawa, one of the stops on their cross-Canada motorcycle tour. We brought them to dinner at the Gastropub and had a delightful evening there. Our server Ivan kept up with our guests’ quick wit and there was fun, friendly banter when each course and the wine were served. The food was delicious. Now this couple knows excellent food and service when they experience it. Upon leaving the restaurant, they declared it was the best meal they had in their multi-month travels from the East Coast to the West Coast!